Planes: Fire and Rescue is pretty much what you would expect from an animated sequel. The story includes disappointment, conflict, determination, a sense of honor and, ultimately, a happy ending. How far can Disney stretch an animated franchise? Pretty far, it seems. As with most of their cartoon features, there is usually a sequel to a successful movie. First there was Planes and now Planes: Fire and Rescue. The second movie will be available on Blu-ray and DVD on November 4, 2014. In this installment we find out hero, Dusty the crop dusting plane turned racing champion, back in his home town. As he rests up and prepares for his next big race, he has a little engine trouble. After a thorough exam, Dusty is informed he has a faulty gear box which can't be replaced because it isn't manufactured anymore. Of course, he tests the limits of his "injury" and ends up setting part of the town on fire. When the safety inspector comes to investigate he finds the rescue squad is subpar and shuts down the entire airport. Without anywhere for the planes to land, the town's corn festival and livelihood are threatened. Feeling it was his fault and lacking a sense of purpose since his "diagnosis" Dusty volunteers to become back up for the fire and rescue squad. He heads off to Piston Peak to be trained and finds an eclectic group of rescue vehicles, as well as a new feeling of hope. Voiced by an all-star cast, including Dane Cook (Dan in Real Life) as Dusty, Ed Harris (Apollo 13, The Abyss) as Blade Ranger, Brad Garrett ( Everybody Loves Raymond) as Dusty's best friend, Chug, and Julie Bowen (Modern Family, Boston Legal) as Lil' Dipper, the acting is excellent. One of the standouts for me was Curtis Armstrong (Revenge of the Nerds, Supernatural ) as Maru, the Mechanic of the fire/rescue squad. He had some great lines and his delivery was always perfect. The Blu-ray Extras include several animated shorts. One of my favorites was Vitaminamulch: Air Spectacular, a nod to the old slapstick vaudeville routines where whatever could go wrong, usually does. The deleted scenes and CHoPs TV promo segments weren't all that entertaining and easily could have been skipped. However, the most interesting extra was the visit the Producer, Ferrell Barron (The Fox and the Hound 2) and Director, Roberts Gannaway (House of Mouse) visited a real life fire and rescue squad and showed how much inspiration they got from the vehicles, men and women who risk their lives working as smoke jumpers. The movie is presented in 1080p video which helps you appreciate the animators' skills and hard work. The Audio is the standard DTS-HD Master Audio 7.1 and lets you experience the wild fire scenes and upbeat soundtrack with clarity and a certain quality you've come to expect from movies now a days. 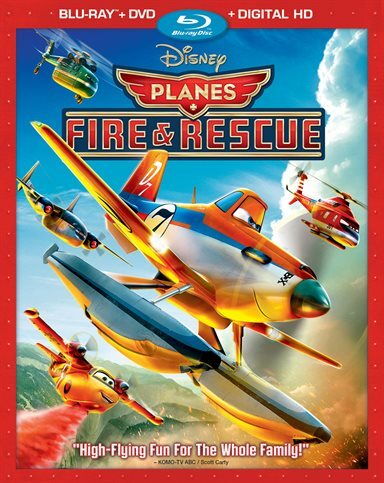 Download Planes: Fire & Rescue from the iTunes Store in Digial HD. For more information about Planes: Fire & Rescue visit the FlickDirect Movie Database.